Lucky for all of us, the fine folks over at My Fantasy League echo my mantra that there is no offseason, and they take right around six weeks off from football before fantasy leagues open for them again. Drafting a fantasy football team in February? That is exactly right. Here is some back story. The concept of best ball is simple yet brilliant; you simply draft a team and move on. You do nothing else with this drafted team until the end of the season where you see what place you came in and what prize you won. Traditional best ball leagues are 20 rounds, while others expand up to 28 rounds. Among best ball, it is generally accepted that none are more popular than the MFL10’s (and 25’s, 50’s, and 100’s) offered by My Fantasy League, over at MFL10s.com (https://www54.myfantasyleague.com/2017/public#0). All of the leagues have the same settings and scoring rules. Each league is comprised of 12 teams and each team drafts to fill 20 roster spots composed of quarterbacks, running backs, wide receivers, tight ends and team defense/special teams. Unlike your home league drafts, when you are on the clock for 90 seconds, you have up to EIGHT hours to make a pick. You will receive an email notifying you that you are on the clock, so be mindful of that clock. In the event that you time out two picks in a row, you will be set to auto-draft for the remainder of the draft, and wind up with a team you may not be thrilled with. There are many reasons why I love drafting in best ball leagues. The convenience factor of being able to draft from a computer or cell phone is a major plus. There is no pressure to beat the clock, but I do recommend being mindful of your league mates and not abuse the eight hour clock. Another appealing aspect of best ball leagues, specifically MFL10s, is the authenticity of the draft. What I mean by that is, you can spend time over the summer on mock drafts, or you can spend $10 here and there on paid drafts to get a more true sense of ADP. If you do enough of those, you will walk into your home league drafts as a seasoned pro. -	Decide what type of player you want to be: Are you aiming for ten drafts? Over 100? Know your investment in advance. -	Monitor ADP: We update ADP directly from My Fantasy League’s data base each week. If you know a thing or two about excel, you can easily import weekly ADP and keep tabs on players who rise and fall. -	Diversify your portfolio of players: You do not want 100% exposure to any one player due to the variance of football and the inherent risk that comes along with it. If you drafted in ten leagues in 2016 and all ten had Jamaal Charles then you essentially lit $100 on fire. I personally try to keep my exposure to around 20-25% per player, but if there is a player you are high on you can take a chance and have him on a third of your rosters. -	Select the auto-tweet option in your settings before your draft: I did not know many people in the MFL10 community when I started out in 2015. That all changed when I began drafted and selected the option for my picks to be auto-tweeted. The conversations and knowledge I gained through them were priceless. If you auto-tweet your picks, people will engage. Keep an open mind and have open dialogue. -	Never be shy about asking questions: I can only speak for myself, but I am sure I am echoing the sentiments of many in the best ball community. Conversation helps us both. If you ever have a question, want to pick brains, or even debate, I encourage you. I love talking about all things best ball and am always available on Twitter (https://twitter.com/FFdeJENerate) for healthy, best ball dialogue. 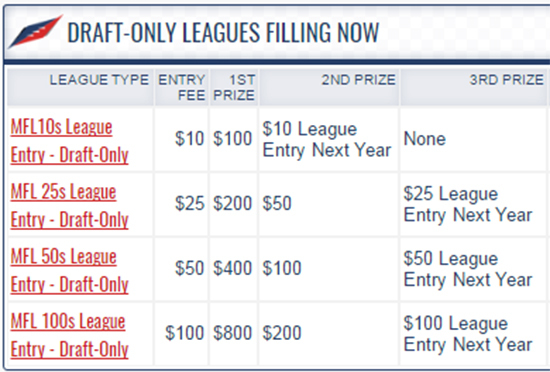 The MFL10 lobby is scheduled to open this week. Drafting in February is tricky and fun. Drafting in August is tricky and fun. Drafting is always tricky and fun. I will be in there drafting throughout the entire offseason. I hope to see you in the lobby.